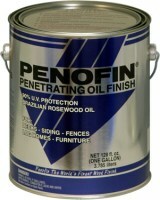 Penofin penetrating oil wood finish is formulated to enhance and protect the natural beauty of any variety of woods. 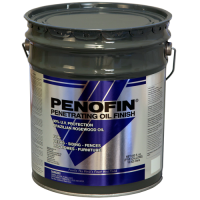 Use Penofin oil wood finish on any exterior wood surface where a transparent finish with ultraviolet protection is needed. Transparent metallic oxides virtually eliminates fading due to sunlight. Pigments won't fade, turn chalky or wash off. No surface film to trap moisture, or cause chipping and peeling. Wide range of transparent and semi transparent colors. Smooth surfaces: 200-300 square feet. Rough surfaces: 125-175 square feet (per gallon) for both coats OF Oil Wood Finish. *This version of Penofin Blue Label is not VOC compliant in the following states and cannot be shipped to them: California, Connecticut, Rhode Island, Maine, Massachusetts, New Hampshire, Vermont, Delaware, District of Columbia, Maryland, New Jersey, New York, Northern VA, Pennsylvania, Ohio, Illinois, Indiana. Our Penofin Red Label can be shipped to all 50 States. Smooth surfaces: 200-300 sq. ft.